When you always need to be ready to run out the door, clean, fresh, and fitted pants are a must. Pants that are easy to care for the best way to always be sure that a clean pair of trousers will be ready for you to wear at a moment’s notice. The Van Heusen Men’s Traveler Pants were specifically made to look great while being super easy to care for. Learn more about these slim fit trousers, and decide if they might be the right fit for you. The Van Heusen Men's Traveler Slim Fit Pants are a slim fit pair of trousers that come in four popular colors: black, taupe, charcoal, and ash navy. These pants were made with a natural stretch and comfort fit to make them the most comfortable. Additionally, they are designed to remain wrinkle and odor free for longer than regular trouser pants. These pants are made for the man who is always on the go. The pants are made of an antimicrobial design that helps prevent odors. Additionally, they have a very comfortable fit, so they might be a great choice for those who move from home to work to meetings to concerts many times each week. These pants are also great for the man who doesn’t want to sacrifice style when choosing a simple-to-care-for pair of pants. The slim fit leg looks very fashion forward, but the stain release and no-wrinkle technology make the pants easy to care for. These pants are not a great choice for those who do not like the look of a slim fit pant. If you prefer a more traditional style trouser leg, you may want to look elsewhere for a different type of pant leg that will suit your style more than this Van Heusen pair of pants. These pants come with no added features or bonuses; you simply receive a pair of pants. Let’s get into the features that make these slim fit Traveler style pants so interesting to many young businesspeople. First, ironing is not a necessity as they're designed to be wash and wear pants. The pants are created with a wrinkle-resistant finish. Once finished washing, they can be tossed in the dryer and worn immediately without having to iron them. Some more great features are the odor-resistant properties. The pants are moisture wicking which may help keep sweat from clinging to your body. Additionally, the pants themselves are antimicrobial. Bacteria-caused smells are eliminated, so you can be active while still feeling and smelling fresh. Finally, the pants' true mission is to be very comfortable for those who are always on the go, and they live up to that mission. The natural stretch of the pants combined with the stretch waist and lightweight material makes for a great, comfortable pair of trousers. Sitting, chasing down a train, hurrying to a meeting, and relaxing can all be achieved in these pants. 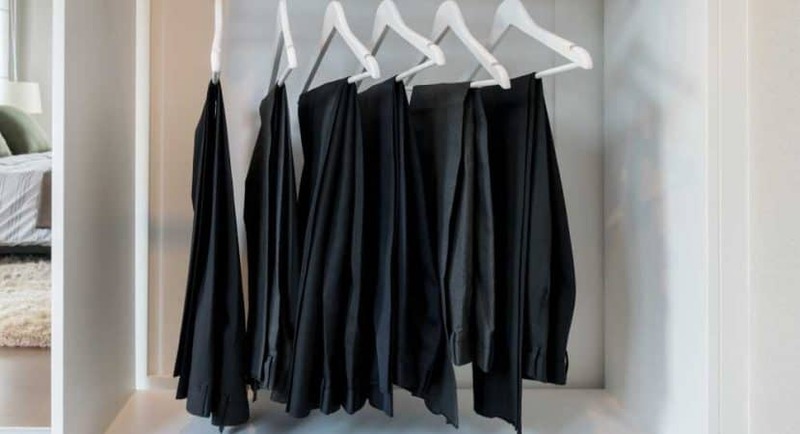 While the colors of the pants are nice, the black is not a very deep, rich black. It is a more subdued color with a subtle vertical line pattern. Depending on your wardrobe, you may find this very appealing or very frustrating. Like any pair of trousers, there are still some are procedures you should follow to make sure they last a long time. These particular pants should be washed on cold settings and hung to dry, when possible. If you plan to use your dryer, you can expect some vertical shrinkage, so make sure to order a longer length to account for this change. For those that would love the convenience of an easy-to-care-for pair of pants but do not want to wear slim cut trousers, try the Van Heusen Men's Flex Straight Fit Flat Front Pants. This alternative boasts the same natural stretch and flex waistband, but the legs are cut for a straight fit. Like the slim fit pants, no-iron technology makes caring for these pants simple. This alternative is also a great choice for those who are wider or taller than the average guy; Van Heusen produces this pair in big and tall sizes, so anyone can find the perfect fit. Finding the perfect pair of dress pants can seem like a chore. Most feel too tight or do not provide a great range of motion. The Van Heusen Traveler pant is another story. When wearing these pants, you might find the natural stretch and comfort fit of the pant so relaxing that you won’t want to take them off after work. And that is the sign of a great pant. One that you’re willing to keep wearing; even after work hours are finished for the day! You might find a pant that does all this for you in this pair from Van Heusen.